everyday except Tuesday. Dinner $17-$26; child menu. No reservations. Casual dress. The best gulf view. Freshest seafood on the beach. 102 Santa Rosa Blvd., on Okaloosa Island. Open 4-10 p.m. Dinner $9-$18. No reservations. Beach or casual dress. 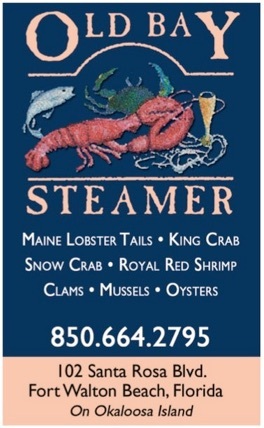 Steamed seafood, royal red shrimp, oysters, clams, mussels, snow/king crab, lobster. Platters for two. VISA, MC, DISC, AMEX. 4424 Commons Drive E., Suite 2C, Destin. Located in the Shoppes at Paradise Key on the corner of Hwy. 98 and the Mid-Bay Bridge. Open daily. We invite you to explore the area's largest walk-in humidor, where we feature a vast collection of rare and boutique cigars. 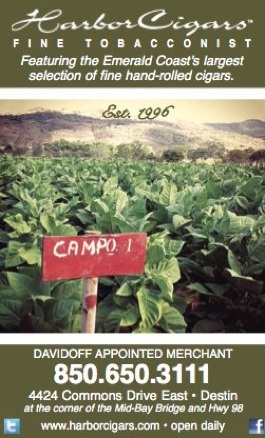 Authorized Retailer of Lampe Berger and Fuente Fuente OpusX. VISA, MC, DISC, AMEX. 172 Harbor Blvd. Destin. Located ¼ mile east of the Destin Bridge. Open daily for lunch, dinner and late-night entertainment. Sat. and Sun. brunch from 10am-2pm. Enjoy breathtaking views of Destin Harbor while enjoying fresh seafood with family-friendly service in a relaxed atmosphere. Plenty of TVs available for watching your favorite sport, and you will find there is “NOT a bad seat in this house.” Good food, live entertainment, and a little more! VISA, MC, AMEX, DISC. 642 Beal Parkway NW, Fort Walton Beach, and 4730 N. Davis Pkwy., Pensacola. Our 4200 sq-ft store is more than a cigar store, it’s the place where customers can unwind after a long day or meet for a pick-me-up with a Cuban espresso before starting your night. Smoking is permitted. We are the only full tobacconist with all your smoking needs. Open Mon.-Sat. 10am-10pm and Sun. 11am-7pm. AMEX, MC, VISA, DISC. 414 Harbor Blvd. Destin. Located on Destin Harbor. Open Sun.-Thurs. 11am-midnight and Fri.-Sat. 11am-2am. 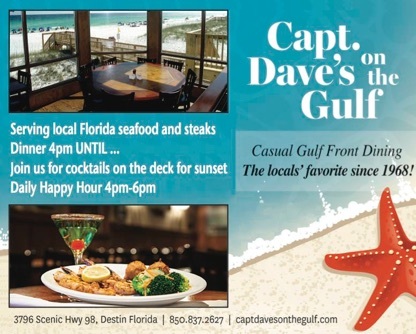 Featuring “Gulf to Table Cuisine” and family-friendly service in a fun, relaxed atmosphere. Take in the view from the dining room, or enjoy eating outdoors on one of our four decks. A sandy-harbor beach allows for family fun and games. Full-service bar, 20 TVs and two large screens for viewing your favorite team. Live entertainment on weekends. VISA, MC, DISC, AMEX. 1740 Scenic Hwy. 98, Destin. Located on the beach, just west of Henderson Beach State Park. Open daily at 11am. A favorite with the locals and visitors since 1974. Enjoy the breathtaking Gulf views from the Back Porch while sipping on your favorite beverage and enjoying some of the best Gulf seafood on the coast. Dine inside or on our beachfront deck. Everything is better when you're at the beach! VISA, MC, DISC, AMEX. Two locations: Located between Destin Commons and Silver Sands at 12540 Emerald Coast Pkwy., and just east of the Navarre Bridge at 8792 Navarre Pkwy. Open Mon.-Sun. 10:30am-10pm. Famous for our “pressed and seared to perfection” Butterburger® and fresh, frozen Custard made hourly. We serve high quality, cooked-to-order, lunch, dinner and in-between-meal treats including soups, salads, shakes, veggie burgers, gluten-free buns and kids’ meals. Visit our comfortable dining room, covered patio or drive-through. VISA, MC, DISC, AMEX. 9375 Emerald Coast Pkwy., Miramar Beach. Located in the Market Shops of Sandestin, by the south entrance of Sandestin Resort. Open Daily 11am-10pm. Peace, Love and Ice Cream. Serving super premium ice cream by the scoop, in cones, cups, sundaes, smoothies and shakes. 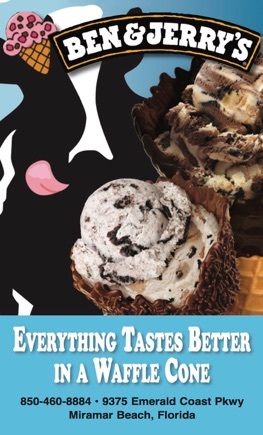 Stop by the only Ben and Jerry’s between St. Augustine and Biloxi to experience the best ice cream served by the friendliest staff. Dine in our spacious, air-conditioned location or enjoy our outdoor seating. Worth the drive from anywhere! VISA, MC, AMEX, DISC. 20001 Hwy. 98 E., Destin. 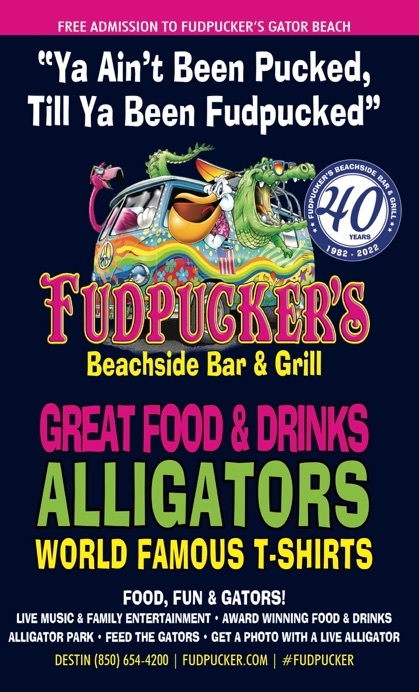 Fudpucker’s is Famous for Great Food, Family FUN, Live Alligators and World Famous T-Shirts! Stuff your face with the “Original” Fudburger or chow down on the best shrimp & local seafood around. Check out Gator Beach - The World’s Greatest Alligator Park – Admission is FREE! Visit website for information on Teen Night, Fudnominals, and Birthday Party Packages. Remember, “Ya Ain’t Been Pucked Til Ya Been Fudpucked!” – Get the T-Shirt to prove it! Open Daily at 11am. Beach or casual dress. 10004 Hwy. 98 W., Miramar Beach. Located just east of Silver Sands Factory Stores. Delivery, catering and carryout. Open daily. Serving award-winning pizzas made from sweet California tomatoes, fresh dough, hand-cut vegetables and Wisconsin cheese blend. We also serve wings, subs, salads, calzones and stromboli. Choose from our menu, or build your own. Order online, by phone or in our store. VISA, MC, AMEX, DISC.